tag: BeYouBling: January's AWESOME Promotion on Starter Kits! January's AWESOME Promotion on Starter Kits! Paparazzi Accessories is having a January promotion on starter kits and that means YOU benefit from the company's generosity! 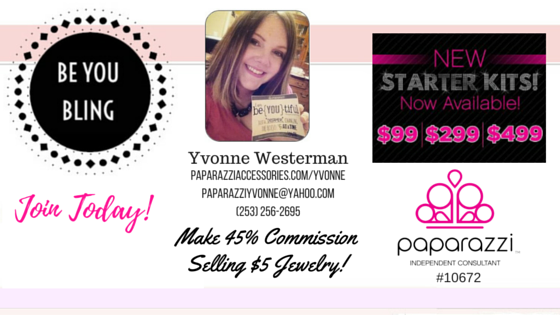 This month ONLY, when you join with a starter kit, you get a $50-$500 credit to spend on the Paparazzi Accessories site on a following order. The size of the credit depends upon the size of the kit you purchase! This means you earn 100% profit from the jewelry you order using your credit! Lucky you! "New Consultants who purchase a Starter Kit during the month of January will have a credit added to their account that can be used towards a future purchase! * This credit can be used to replenish inventory, stock up on business tools, or pick up some Paparazzi-branded apparel – it’s entirely up to them! I'd love to share more details with you about this promotion, starter kits and the company. Feel free to email me, call me or text me. My number is 253-256-2695 My email is yvonnejams@yahoo.com.